Presto! Catcher in the Rye. 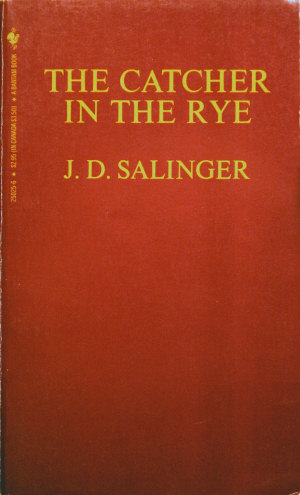 Salinger’s book is my favourite, a work that explained to me my feelings of alienation while growing up as a C.B.C. (Canadian Born Chinese) split between two worlds, Chinese and Canadian, and wanting to be accepted by both. Perhaps that’s one reason why early on I loved English Literature so much: it was a way to be accepted by the ascendant class in Toronto during the 1970s. How much more Canadian can I be if I studied the literature? Too bad racists are philistines. But I digress. Frye helped explain my love of The Catcher in the Rye: The Concrete Universal. By being so specific, the novel speaks universally, beyond the limits of its time and place and setting. It is a work situated somewhere in phase 1 of Satire/Comedy, which may also explain the universal power of Ferris Bueller’s Day Off. Frye helped me see that the latter is the mythical opposite of Catcher, a full blown Quest Romance/phase 2 Satire. Both protagonists skip school. Both travel through a big city. Both have dates. Both have a kid sister integral to the resolution. The difference is in the power of the main character when confronted by society. Ferris is one with his society. Holden is not, until the very end — the last line, in fact. Those who say Catcher is a depressing book are guilty of a substantial misreading. It has saved me on several occasions. Thank you J.D. Salinger. And, as always, thank you Northrop Frye. This entry was posted in Archetype, Popular Culture on January 28, 2010 by Peter "StirFrye" Yan.